Visual Studio Code>Other>Azure ReposNew to Visual Studio Code? Get it now. Connect to Azure Repos and work with Git and Team Foundation Version Control (TFVC) repositories. Manage your pull requests, work items, and more. This extension allows you to connect to Azure DevOps Services and Team Foundation Server and provides support for Team Foundation Version Control (TFVC). It allows you to monitor your builds and manage your pull requests and work items for your TFVC or Git source repositories. The extension uses your local repository information to connect to either Azure DevOps Services or Team Foundation Server 2015 Update 2 (and later). 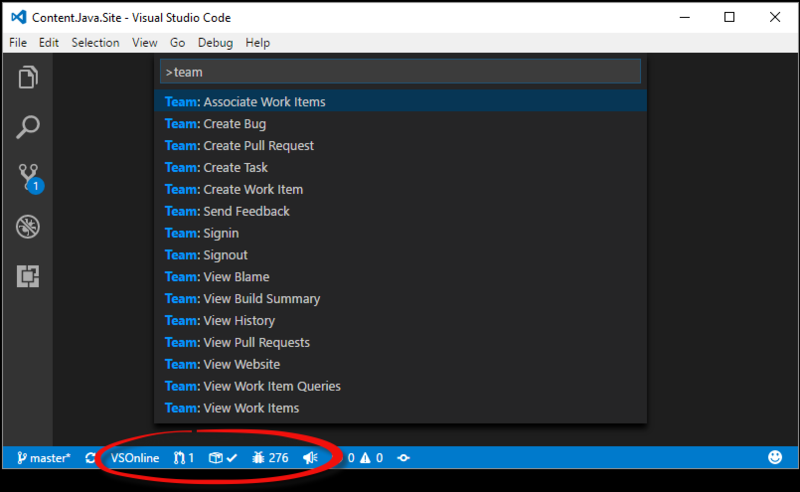 Here is the Walkthrough of the Azure Repos extension for Visual Studio Code video that shows many of the features of the extension. If you are using the extension with Azure DevOps Services, ensure you have an Azure DevOps Services organization. If you do not have one, sign up for Azure DevOps Services. If you are planning on using the extension with Team Foundation Server, you must be running Team Foundation Server 2015 Update 2 or later. Earlier versions of Team Foundation Server are not supported. With Git, the extension uses the remote origin of your repository to determine how to connect to Azure DevOps Services (or your Team Foundation Server), in most cases you will need to have a Git repository already cloned locally. If you intend on cloning an existing repository, do so before proceeding. If you do not have a Git repository cloned locally but already have an Azure DevOps Services organization (or a Team Foundation Server instance), you may create a local repository (via git init) and once you set the "origin" remote for that local repository, the extension will detect the change to the remote and attempt to contact Azure DevOps Services (or Team Foundation Server). With TFVC, the extension uses information about the current workspace to determine how to connect to Azure DevOps Services (or your Team Foundation Server). Workspaces can be created using the Visual Studio IDE, Eclipse or with the JetBrains IDEs (e.g, Android Studio, IntelliJ). Note: At this time, you will need to have a local TFVC workspace already available on your local machine. More information about the difference between the two types (and how to determine which one you're using) can be found here. The issue tracking support for Server workspaces is here. First, you will need to install Visual Studio Code 1.12.0 or later. To install the extension with the latest version of Visual Studio Code (version 1.13.1 is the latest as of this writing), bring up the Visual Studio Code Command Palette (F1), type install and choose Extensions: Install Extensions. In the Search Extensions in Marketplace text box, type team. Find the Azure Repos extension published by Microsoft and click the Install button. Restart Visual Studio Code. If you are connecting to Azure DevOps Services, you will need a personal access token (PAT). With the release of v1.121.0 of the extension, you have a choice of whether you would like to create a token yourself manually and provide it when prompted, or use a new experience in which you are authenticated to Azure DevOps Services using your web browser. In the new experience, a personal access token is still created on your behalf but only after you are authenticated. The created token has All Scopes permissions but can be updated in your profile settings. Both tokens (manual or the new experience) are stored securely on your machine. Should you wish to create a personal access token yourself, go here to read how. You can also view our video on how to do the same. Git repositories require that you create your token with the Build (read), Code (read) and Work items (read) scopes to ensure full functionality. You can also use All Scopes, but the minimum required scopes are those listed above. TFVC repositories require tokens with All Scopes. Anything less will cause the extension to fail. When using the new authentication experience, you will be prompted to copy a device code used to identify yourself to the authentication system. Once you accept the prompt to begin authentication, your default web browser will be opened to a login page. After supplying that device code and having it verified, you will then be prompted to authenticate with Azure DevOps Services normally (e.g., username and password, multi-factor authentication, etc.). Once you are authenticated to Azure DevOps Services, a personal access token will be created for you and the extension will be initialized normally. To see what this experience is like, view this video. If you are connecting to Team Foundation Server, you will only need your NTLM credentials (domain name, server name and password). It is assumed that you have the proper permissions on the TFS Server. Details on how to connect to either Azure DevOps Services or Team Foundation Server are found in the next section. Once you have a local TFVC workspace available, you must configure the TFVC support in Visual Studio Code. You can find that information (including demo videos) in our TFVC documentation. Once you have installed the extension, open either the root folder or a sub-folder of the repository. Once an Azure DevOps Services or Team Foundation Server 2015 Update 2 (or later) repository is detected by the extension, you will need to provide your credentials (if credentials weren't already found). If you are required to provide your credentials, there will be an indicator in the status bar whose message will indicate that you need to sign in. To sign in, run the team signin command or simply click on that indicator. If your repository is hosted on Azure Repos, you will be prompted to enter your personal access token. When you do, it will be stored securely on your computer and used to connect. If your repository is on Team Foundation Server 2015 Update 2 or later, you will be prompted to enter your username and password. After both are provided, they will be stored securely on your computer and used to connect to your TFS server. Once your credentials are verified, the status bar indicators will be active and the remaining commands will be ready to use. The stored credentials will be used for each connection to the server until they are either removed by the team signout command or overwritten by a subsequent team signin command. Note: In order for the extension to be activated, a repository folder must be opened. The extension won't be activated if only a single file in the repository is opened. – This status bar item is populated with the name of the team project to which the repository belongs. Clicking on the item will open your browser to the team website. – Git only This status bar item is a count of active pull requests that you either requested yourself or were added to explicitly as a reviewer. Clicking the item will display that list of pull requests in the quick pick list. Choosing one will take you to that pull request in your browser. This indicator will update its status every 5 minutes. – This status bar item shows the status of the build for this particular repository and branch. Hovering over the item will provide additional information about which build was referenced (if any). Clicking on the item will take you to that build’s summary page in your browser. This indicator will update its status every 5 minutes. – This status bar item shows the number of items returned by your pinned work item query. If you have not configured a pinned query it defaults to the work items assigned to you. Clicking the item will show you the work items the query returns. This indicator will update its status every 5 minutes. – Clicking this status bar item allows you to quickly send feedback about the Azure Repos extension. In addition to the status bar integrations, the extension also provides several commands for interacting with Azure DevOps Services and Team Foundation Server. In the Command Palette (F1), type team and choose a command. team associate work items – Prompts you to choose a work item that is assigned to you (or from the results of your custom query). Choosing a work item will add it to the current commit/check-in message. team create bug – Opens your browser to the webpage used to create a new bug. If a single line of text is highlighted in Visual Studio Code, it will be used as the title of the bug. The bug will be assigned to you. You can then choose to update the fields, save, cancel, etc. team create pull request – Git only Opens your browser for a new pull request based on the current repository and branch. Before creating the pull request, ensure that you save, commit and push any changes you have before running the command. Doing so will ensure that all of your latest changes are part of the pull request. team create task – Opens your browser to the webpage used to create a new task. If a single line of text is highlighted in Visual Studio Code, it will be used as the title of the task. The task will be assigned to you. You can then choose to update the fields, save, cancel, etc. team create work item – Prompts you to choose a work item type from the list available in your team project. Once you make a selection, your browser is opened to the webpage used to create the work item. If a single line f text is highlighted in Visual Studio Code, it will be used as the title of the task. The work item will be assigned to you. You can then choose to update the fields, save, cancel, etc. team send feedback – Prompts you to either send a smile or a frown. After choosing, you can provide us feedback of up to 1000 characters. Optionally, provide your email address so we can contact if you needed. If you do not want to provide your email address, just leave it empty (we'll still get your feedback). Note: Feedback can be sent even if telemetry reporting is disabled. team signin – Use this command to sign in to an Azure DevOps Services organization or Team Foundation Server 2015 Update 2 (and later) server. When your credentials are provided, they will be stored securely on your computer. The saved credentials will be used for that organization until they are removed by the team signout command or overwritten by a subsequent team signin command. See the "Secure Credential Storage" topic below for more details. team signout – Use this command to sign out from an Azure DevOps Services organization or Team Foundation Server 2015 Update 2 (and later) server. Signing out will remove your credentials from your local computer. To sign back in, you will need to run the team signin command again. team view blame – Git only If a file in the repository is opened in the editor, it will open your browser to the blame page for that file in the current branch in the server repository. team view build summary – Same behavior as clicking on the Build Status status bar item. team view history – If a file in the repository is opened in the editor, it will open your browser to the history page for that file in the current branch in the server repository. Otherwise, the history of the current branch in the server repository will be opened. This command does support TFVC repositories. team view pull requests – Git only Same behavior as clicking on the Pull Requests status bar item. team view website – Same behavior as clicking on the team project status bar item. team view work items – Prompts you to choose a work item that is assigned to you, sorted by ChangedDate descending. Choosing a work item will open it in your browser. This command will return a maximum of 200 results with an option to "Browse additional work items...". Choosing that option will open your browser to show all of the results of your query. team view work item queries – Prompts you to choose a query stored in your “My Queries” folder in your team project. Choosing a query will run it and display the results in the Quick Pick list. Choosing one of the results will open that work item in your browser. This command will return a maximum of 200 results with an option to "Browse additional work items...". Choosing that option will open your browser to show all of the results of your query. When you run the team signin command, the credentials that you provide will be stored securely on your computer. On Windows, your credentials wil be stored by Windows Credential Manager. On macOS, your credentials will be stored in the Keychain. On Linux, your credentials will be stored in a file on your local file system in a subdirectory of your home folder. That file is created only with RW rights for the user running Visual Studio Code. It is not encrypted on disk. The Azure Repos extension collects usage data and sends it to Microsoft to help improve our products and services. Read our privacy statement to learn more. The polling interval for the pull request and build status bar indicators defaults to ten minutes. You can change this value in the Visual Studio Code Settings by adding an entry like the one below. The minimum value is 10. There may be times when you need to enable file logging to troubleshoot an issue. There are five levels of logging (error, warn, info, verbose and debug). Since logging is disabled by default, you can add an entry like the one shown below to Visual Studio Code's Settings. Once you are finished logging, either remove the setting or set it to an empty string. The log file will be placed at the root of your workspace and will be named team-extension.log. In order to facilitate more debugging, you may be provided with a "private build" of the extension. The private build will likely come in the form of a .ZIP file named similarly to the VSIX that gets deployed to the Marketplace (e.g., team-0.117.0.vsix.zip). To install the private build, you must uninstall the previous version and then side load the new one. First, remove the .ZIP extension from the file and then follow these instructions to install the VSIX. account: For Azure DevOps Services, set account to either organization.visualstudio.com or dev.azure.com/organization. For Team Foundation Server, if your server URL is http://servername:8080/tfs then set account to servername:8080. "queryText": "SELECT * FROM WorkItems WHERE [System.AssignedTo] = @me AND [System.ChangedDate] > @Today - 14"
"queryPath": "Shared Queries/My Folder/My Query"
You can also create a global pinned query which will be the default if you have not configured one by replacing dev.azure.com/organization with global in the previous examples. Starting with version 1.113.0, you can now use the extension with repositories that are not hosted with either Azure DevOps Services or Team Foundation Server. You will be able to monitor your builds (for a specific build definition) and work items that are hosted with either Azure DevOps Services or Team Foundation Server by specifying your server information. To do this, set the following settings in VS Code. It is recommended that you set these in your Workspace Settings (and not User Settings). You will, of course, still need to authenticate (provide credentials). Note: If you're using a Team Foundation Version Control repository, you should not use these settings. Have a look at the TFVC Quick Start. To determine your build definition id, open the build summary for the build you'd like to monitor and grab the value of the buildId= parameter in the url. Support for this extension is provided on our GitHub Issue Tracker. You can submit a bug report, a feature request or participate in discussions. The Microsoft Visual Studio Product Family Privacy Statement describes the privacy statement of this software.